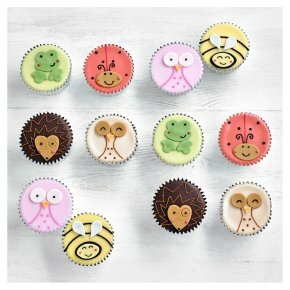 8 Golden Sponge Cakes topped with fondant icing with Frog, Ladybird, Bee and Pink Owl designs and 4 Chocolate Cup Cakes topped with fondant icing with Hedgehog and Brown Owl designs. INGREDIENTS: sugar, fortified wheat flour (wheat flour, calcium carbonate, iron, niacin, thiamin), rapeseed oil, water, maize and wheat glucose syrup, dried free range egg, cocoa mass, emulsifiers (mono- and diglycerides of fatty acids, soya lecithin, sodium stearoyl-2-lactylate, polyglycerol esters of fatty acids, lactic acid esters of mono- and diglycerides of fatty acids, propane-1;2-diol esters of fatty acids), fat reduced cocoa powder, cocoa butter, modified maize starch, palm oil, raising agents (diphosphates, sodium carbonates), salt, milk whey powder, preservative (potassium sorbate), humectant (vegetable glycerine), colours (plain caramel, beetroot red, vegetable carbon, paprika extract, curcumin, titanium dioxide, lycopene, copper complexes of chlorophyllins), dried free range egg albumen, wheat gluten, stabiliser (tragacanth), spirulina, flavouring. Allergy Advice For allergens, including cereals containing gluten, see ingredients in bold May also contain nuts and peanuts. May contain: nuts.